Standard-issue stock of the IDF incorporates many features prefered by folks operating in real-world combat situations. 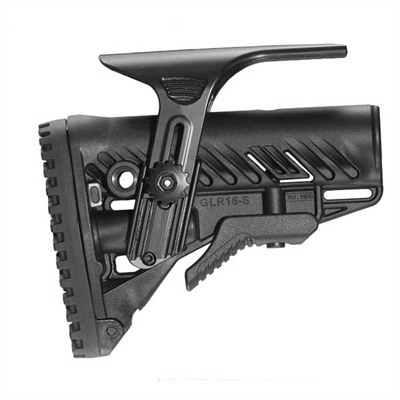 The GLR-16 has a built-in battery storage compartment and 6 separate sling attachment points that can be used with single-point, 2-point, and 3-point slings. A unique auto-tensioning system allows this stock to be installed on both mil-spec and commercial receiver extension tubes without looseness or rattling. Molded from mil-spec reinforced polymer composite with steel hardware and a non-slip, rubber recoil pad. Comes with a detachable cheek riser. Mfg: Fab Defense SPECS: Mil-spec reinforced polymer composite, matte black. Fits any M4-type receiver extension for collapsible stock.Comes with cheek riser, but no buffer tube, buffer, or spring.